The Logar Valley (Slovene: Logarska dolina, Logarjeva dolina) is a valley in the Kamnik Alps, in the Municipality of Solčava, Slovenia. The Slovene name for the valley is of relatively recent coinage and is derived from the Logar Farm, which in turn is derived from log (literally, 'swampy meadow'). In 1987, the valley received protected status as a landscape park encompassing 24.75 square kilometres (9.56 sq mi). The Logar Valley is a typical U-shaped glacial valley. It is divided into three parts. The lower part is named Log, the middle part Plest or Plestje (it is a mostly wooded area), and the upper part Kot (literally 'cirque') or Ogradec (it is a wooded area with scree slopes). Altogether 35 people live on the isolated farmsteads in the valley. The Logar Valley is ringed by the following peaks: Strelovec (1,763 m or 5,784 ft), Krofička (2,083 m or 6,834 ft), Ojstrica (2,350 m or 7,710 ft), Lučka Baba (2,244 m or 7,362 ft), Planjava (2,394 m or 7,854 ft), Brana (2,252 m or 7,388 ft), Turska Gora (2,251 m or 7,385 ft), and Mrzla Gora (2,203 m or 7,228 ft). It terminates in a head wall beneath the Okrešelj Cirque, where the Savinja River starts at an ice-cold spring at an elevation of 1,280 meters and flows to Rinka Falls. 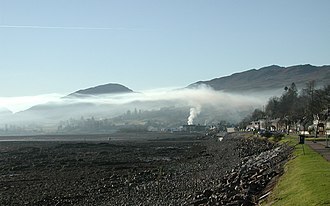 Although the Logar Valley is not particularly narrow (about 500 m at its narrowest), inversions are very common due to the influence of a northern anticyclone. Temperature distributions on the slopes are greatly influenced by differences between the sunny and shady areas, which is seen in different snow and ice conditions in the winter. A walking path (2–3 hours) through the valley leads past a number of points of interest: the source of Black Creek (Črna), wooden logging chutes, a burl-covered ash tree, a charcoal-maker’s hut, and other sights. ^ "Predstavitev Krajinskega parka Logarska dolina". Retrieved 5 May 2013. ^ "Data on ProtectedPlanet.net". World Database on Protected Areas (WDPA). Retrieved 5 May 2013. ^ a b c d Mišič, Franc. 1938. "O ledinskih in hišnih imenih okoli Solčave." Časopis za zgodovino in narodopisje 33(3/4): 191–201, p. 197. ^ Hrvatin, Mauro. "Logarska dolina" [Logar Valley]. In Šmid Hribar, Mateja; Golež, Gregor; Podjed, Dan; Kladnik, Drago; Erhartič, Bojan; Pavlin, Primož; Ines, Jerele. Enciklopedija naravne in kulturne dediščine na Slovenskem – DEDI [Encyclopedia of Natural and Cultural Heritage in Slovenia] (in Slovenian). Retrieved 19 February 2013. A landscape park is a type of protected area in Czech Republic, Slovakia, Ukraine and Slovenia. It is of lower status than a National Park and with less stringent restrictions on development, Landscape parks are organized with withdrawal or without withdrawal of land plots and other natural objects from their owners or users. As of 2007 there were 25 landscape protected areas in the Czech Republic of approximately 10,500 square kilometres, see Protected Landscape Parks of the Czech Republic. Decisions on the creation and boundaries of Landscape Parks are taken by resolution of the provincial assembly, a decision to create a Landscape Park must be preceded by consultation with the council of any relevant gmina and with the Regional Director of Nature Protection. A buffer zone may be designated in addition to the area of the Park itself, as at 9 May 2009 there are 122 designated Landscape Parks throughout Poland, covering a total area of approximately 26,100 square kilometres. For a listing, see list of Landscape Parks of Poland, there are 14 Protected Landscape Areas in Slovakia. Scree is a collection of broken rock fragments at the base of crags, mountain cliffs, volcanoes or valley shoulders that has accumulated through periodic rockfall from adjacent cliff faces. Landforms associated with these materials are called talus deposits. Talus deposits typically have a concave form, while the maximum inclination corresponds to the angle of repose of the mean debris size. The term scree comes from the Old Norse term for landslide, skriða, formation of scree or talus deposits the results of physical and chemical weathering and erosion acting on a rock face. During the day, water can flow into joints and discontinuities in the rock wall, if the temperature drops enough, for example in the evening, this water may freeze. Since water expands by 9% when it freezes, it can generate forces that either create new cracks or wedge blocks into an unstable position. 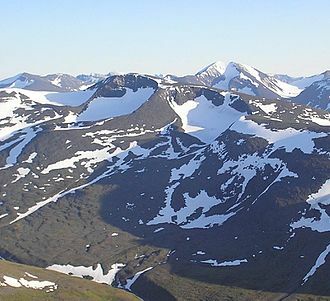 Special boundary conditions may be required for this to happen, the efficiency of freeze/thaw processes in scree production is debated by scientists. The Kupa or Kolpa river, a right tributary of the Sava, forms a natural border between north-west Croatia and southeast Slovenia. It is 297 kilometres long, with its part having a length of 118 km. The Kupa originates in Croatia in the region of Gorski Kotar, northeast of Rijeka. It flows a few kilometers eastwards, receives the small Čabranka River from the left and it continues eastwards between the White Carniola region in the north and Central Croatia in the south. The Kupa receives influx from the river Lahinja from the left in Primostek, passes Vrbovsko and it reaches the city of Karlovac, where it receives influx from two other rivers from the right and Korana. The Kupa continues flowing to the east, where it merges with Glina from the right as well as Odra from the left, fairly unpolluted downstream to Karlovac, the upper Kupa is a popular place for bathing in summer. The section from Stari Trg down to Fučkovci since 2006 is part of the Slovenian Krajinski park Kolpa nature reserve, the hydrological parameters of the Kupa are regularly monitored at Radenci, Kamanje and Jamnička Kiselica. The Ljubljanica, known in the Middle Ages as the Ljubija, is a river in the southern part of the Ljubljana Basin in Slovenia. The capital of Slovenia, lies on the river, the Ljubljanica rises south of the town of Vrhnika and outflows in the Sava River about 10 kilometres downstream from Ljubljana. Its largest affluent is the Mali Graben Canal, including its source affluent the Little Ljubljanica, the river is 41 km in length. The Little Ljubljanica joins the Big Ljubljanica after 1,300 m, the Ljubljanica has become a popular site for archaeologists and treasure hunters to dive for lost relics and artifacts. One of the significant findings is a yew spearhead, found in 2009 in Sinja Gorica. It has been dated to about 35,000 to 45,000 before present, the Szeletien period, and supplements the scant data about the presence of Stone Age hunters in the Ljubljana Marshes area. Exactly why the Ljubljanica became a dumping ground is unknown. These treasures may have offered to the river during rites of passage, in mourning. The Idrijca is a river flowing through the Idrija Hills and Cerkno Hills. It rises near Vojsko, flows towards northeast and after passing through Idrija turns to the northwest, after passing through Spodnja Idrija and Cerkno it joins the Soča in Most na Soči. It has the pluvio-nival regime and belongs to the Adriatic Sea Basin, the river basin has an area of 598 square kilometres. The major tributaries are the Belca, Cerknica, and Bača from the right and the Nikomlja, Kanošica, one of the right tributaries is the Jezernica River, which originates from the Wild Lake. Being only 55 m long, the Jezernica is the shortest river in Slovenia, the river has many fish, among which the Salmo marmoratus, the Rainbow Trout, and the Grayling are noteworthy. In the past, timber was driven down the Idrijca to Idrija to be used as pillars in the Idrija mercury mine, special logging sluices were employed for this purpose from the 17th until the 19th century. The area of the upper Idrijca has been proclaimed the Upper Idrijca Landscape Park and it encompasses numerous karst features and diverse plant species. Wetlands alongside the Morava River in Záhorie Protected Landscape Area (Slovakia). Regional Landscape Park «Kleban-Byk». Kleban-Bytske water basin. Burls on a tree trunk in Norfolk, England. The Ljubljanica flows through Ljubljana. In its upper course, the Kupa flows through the Dinaric Alps until exiting from Kočevski Rog and Ogulinsko zagorje. In its lower course, the Kupa meanders through the plains of the Pannonian Basin. The confluence of the Sava and the Savinja at Zidani Most, where the Savinja is traversed by three bridges. The photo was taken in 1914, before the construction of the new railroad bridge. The Mirna River at Mirna Castle, before the confluence with Vejar Creek (downstream view). Mirna Pond to the right is a dammed pond on Vejar Creek.